The external conditions facing the transition economies slightly improved on balance during the year 2004. 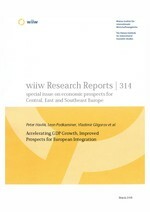 The eight new EU member states of Central and Eastern Europe (NMS-8) recorded higher GDP growth (5% on average) than in the previous year, largely thanks to expanding domestic demand - in particular of investment (Czech Republic, Hungary and Latvia) and of private consumption (Poland, Slovakia, Estonia and Lithuania). Growth accelerated also in Southeast Europe (except Croatia and Macedonia), as well as in Belarus and Ukraine (Russia's GDP grew by 7% again). The transition economies have thus been one of the most dynamic regions in the world. The NMS have been growing more than 2 percentage points faster than the 'old' EU-15. These countries not only add a certain dynamism to the European economy but put some pressure on the EU reform agenda as well. On the downside, the situation on the labour market remains precarious, robust economic growth notwithstanding. The average rate of unemployment in the NMS is nearly twice as high as in the EU-15 (mainly on account of Poland and Slovakia); in most of Southeast Europe it is even higher, with little prospect for marked improvements any time soon. The latter refers to industry in particular, which - despite a remarkable acceleration of output growth (10% on NMS average in 2004) - continues to shed labour. This implies impressive gains in labour productivity and, given the general wage restraint, in unit labour costs as well. The improving international costs competitiveness of NMS has recently been eroded by appreciating domestic currencies (Hungary, Poland and Slovakia). After a temporary increase in 2004 (largely caused by tax adjustments prior to EU accession and rising energy prices), inflation resumed its downward trend, reaching low single digits in most NMS (except Slovakia) and in the remaining transition countries as well (except Romania, Serbia and Ukraine). Russian inflation has been stubbornly high, fuelled by large inflows of foreign currency, tariff hikes and galloping producer prices. The remaining inflation differential with respect to the eurozone, magnified by a natural appreciation tendency of NMS currencies (frequently stimulated by short-term capital inflows) may lead to competitiveness losses in the future. Given the ongoing productivity and quality improvements this danger is not imminent in most NMS yet. Still the exchange rate developments should be watched closely, not least in the period prior to EMU accession, which in several NMS will probably extend beyond 2010. The need to reduce excessive budget deficits represents another challenge facing several NMS in the coming years. The outstanding feature of last year's economic developments was a boost in foreign trade (or of intra-EU dispatches and arrivals in the case of NMS). NMS exports jumped by more than 20% in current euro terms, somewhat faster than imports (+18%), yet their aggregate trade balance slightly deteriorated (in fact foreign trade contributed positively to GDP growth in Poland only). Nonetheless, the export sector of NMS is strengthening - not least thanks to sustained reforms and large FDI inflows in the past few years - and their integration in the European and world economy is increasing. Today, 86% of NMS exports and 72% of imports represent intra-EU trade. Given the high (and rising) export surpluses of Russia and Ukraine - in both cases swelled by rising world market commodity prices - the trade contribution to growth has been positive in these countries as well. After the takeover of EU external trade policies upon accession, especially intra-NMS trade (preliminary estimates suggest an increase by 30% in 2004) and extra-EU trade are booming. Altogether, the NMS enjoy a surplus in trade transactions with the EU, an achievement attributable largely to the high and growing surpluses of the Czech Republic, Hungary and Slovakia (and to a lower deficit in Poland); the separate effect of trade with the EU on GDP growth was most likely positive. In Southeast Europe, trade integration is (with few exceptions such as Bulgaria) still rather low and many countries in the region suffer from huge trade and current account deficits which may not be sustainable (particularly in Bosnia and Herzegovina, and Serbia). The EU accession of eight Central and East European countries on 1 May 2004 has brought few surprises and may generally be considered a success. The accession was well prepared and managed. The direct economic effects of accession on the NMS are difficult to identify: economic growth, especially of industry, had speeded up already before May 2004, a temporary increase of inflation was soon successfully contained and domestic currencies strengthened. Net transfers from the EU budget were negligible (less than 1% of NMS GDP), yet inflows of FDI picked up in 2004 again - albeit remaining below the peak of 2000-2002. The GDP growth outlook is fairly robust: barring major external shocks, the NMS are expected to grow by 4-5% annually in the coming years (the Baltic States will continue to enjoy even somewhat higher growth) thus maintaining their speed of nominal and real convergence to the 'old' EU. Inflation is converging to eurozone levels as well. The shadow side of this fairly upbeat forecast is the labour market where no substantial reduction of unemployment is expected. Estonia, Lithuania and Slovenia (all already participating in the ERM II) may adopt the euro in late 2006 or early 2007, with the remaining 'high-deficit' NMS following suit during 2008-2010. Also the economic outlook for Southeast Europe is more encouraging now than in the recent past: GDP growth will accelerate in most countries (without recurring inflation), but unemployment will remain high. As far as the integration prospects of this region are concerned, Bulgaria and Romania will become EU members in 2007, followed by Croatia in 2008 and with Macedonia the next candidate. The coming two years will be crucial also for the remaining countries of the Western Balkans as a number of exceptionally difficult issues will have to be solved (in Bosnia and Herzegovina, Serbia, Montenegro and Kosovo). If everything goes well (and there are a lot of caveats) the whole region could be in the EU around 2015. However, by that time the issue of Turkey's EU membership will have to be finally decided and a possible application of Ukraine (as well as Moldova) for EU membership will have to be dealt with. In addition, the enlarged EU will simultaneously have to clarify its relations with Russia. These challenging developments will doubtlessly require a new (and this time much more radical) reform of the whole system of EU institutions.